I haven't done a review in a little while, and that bugs me somewhat. I was aiming to write and post a review every week, but these days I've not been posting as much as I used to. In fact, I think I'm actually down to two posts a week, instead of my usual three. I'd have everything written up and the photos taken, but life gets in the way, and I'm not able to edit the photos or have the posts up and running. I'd have my posts scheduled to go live on a designated day, but I never get to that point because I'm always interrupted, even on Fridays, which is meant to be my blog day. It's very frustrating, and I'm trying to get things back in order so that I can get ahead and be more organised. I think the whole blog-in-one-day feels more like a chore than a hobby which is why I'm not getting a lot of motivation in writing. I decided to break down my tasks and spread them over a few days during the week because that is what I prefer, and I enjoy the process more. Contrary to what some people may think, I blog for the creative outlet it provides, not because it's a potential source of income. 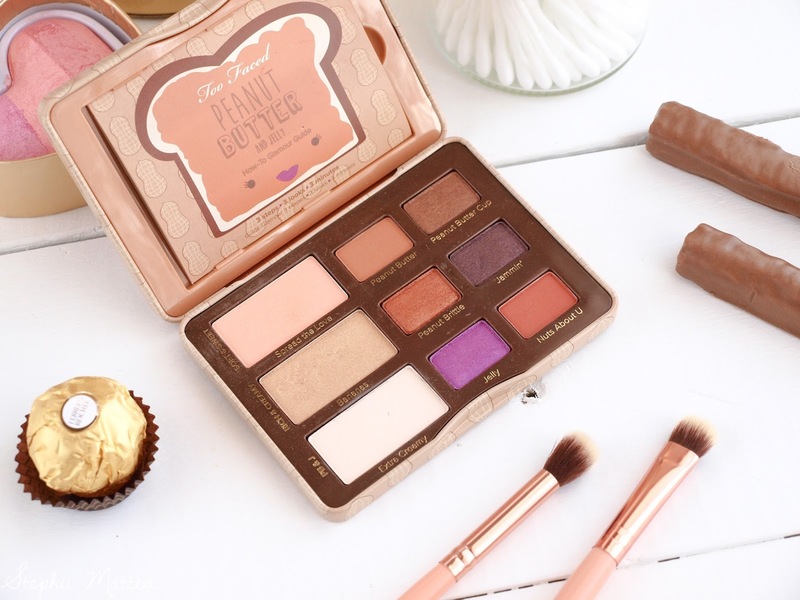 Anyways, before I digress any further from the purpose of this post, I wanted to review the Too Faced Peanut Butter and Jelly palette. I got this palette as a treat to myself sometime last year, following a bout of depression and general unhappiness with my life and where it was going. 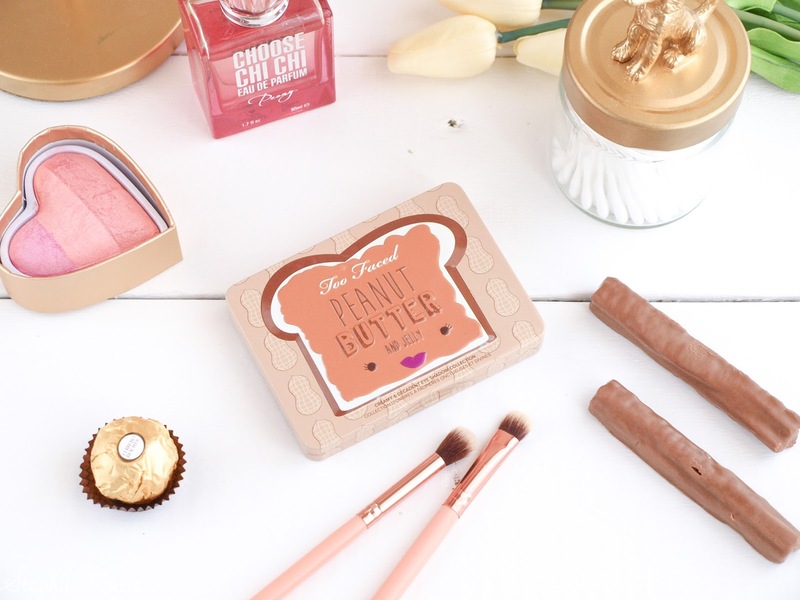 I was actually planning on getting the Chocolate Bar, but then Too Faced dropped this and I was in a tizzy over it because I love peanut butter. 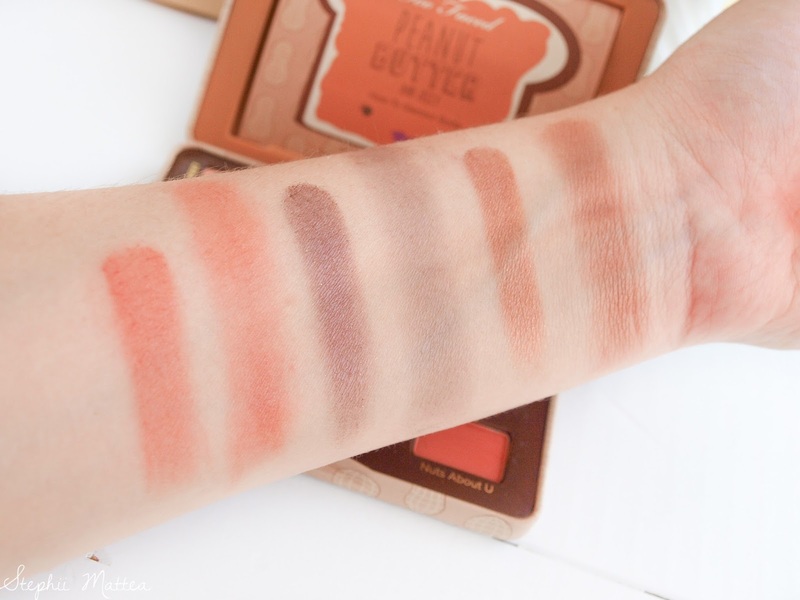 I figured, since the Chocolate Bar was a permanent palette in their lineup, I could get it later for my birthday. Of course, that was before they were sold to Estee Lauder. Let's talk about the packaging. This comes in an iconic metal palette with a magnetic closure. It's quite sturdy in that it wouldn't ever break, but I highly doubt it would be suitable for travel because it can fall open while being jostled around. It comes with a small mirror that's not really useful when you're trying to do your whole face on the go. The palette houses nine eyeshadow pans with lots of space between each pan. There are three base shades on the left and they're thrice as big as the other pans. Each of the pans come with golden text that shows the name for each shade. The palette comes with a booklet that slots into space in front of the mirror under the lid, featuring a few different looks that one can do with this palette. 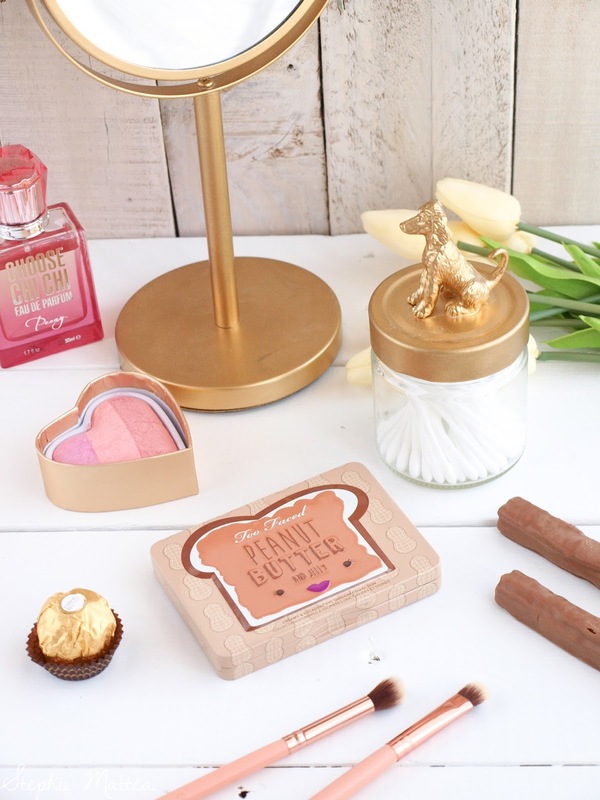 The palette has a very cute design, of peanuts in the background and a slice of bread on the front with peanut butter smeared on it and a tiny face under the text. I've been using this palette with the Wet n Wild Photo Focus Eyeshadow Primer, as I cannot hope to keep eyeshadow flawless for an hour without it. It lasts all day with the primer, late into the night, with barely a crease in sight (pun intended). I find these shadows easy to blend and apply, and I rarely experience any fallout, not even in the pan. It doesn't get messy, and most of the shades take well to being layered and built upon for a more intense colour. Well, except Jammin', but more on that later. 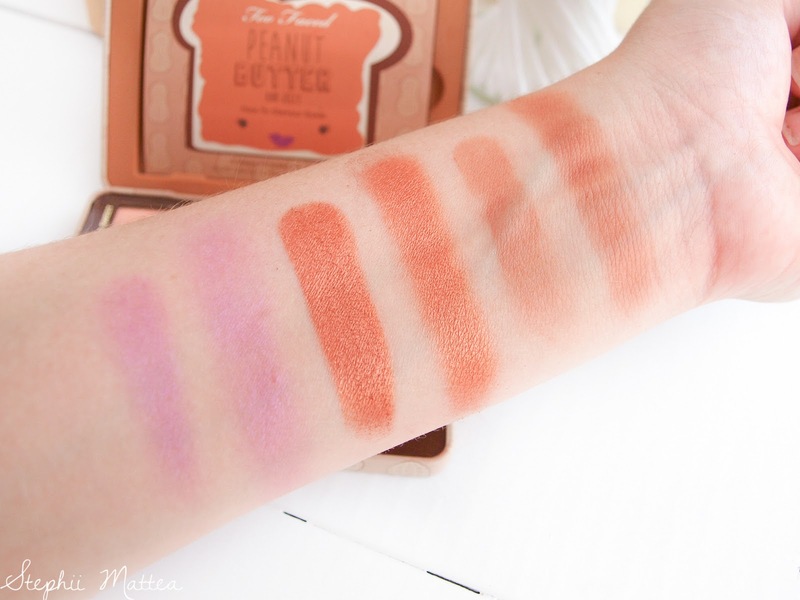 I realised, after reading comments by professionals and makeup artists, that finger swatches aren't representative of the product's true performance, because you could have something that felt super buttery but performed poorly when applied with a brush, or you could get something that didn't swatch particularly well but looks great when a brush is used to apply it. It was then that I decided I would do both finger swatches and brush swatches to show the difference. The eyeshadows were swiped with the finger twice, and is the left one of each pair of swatches, while I've gone back and forth with the brushes a few times. On the left we have the base shades; Spread the Love, which a pale peach that's matte but with a hint of pale gold shimmer. The glitter doesn't really show up as much when applied but because the shade is kinda chalky, the glitter tends to fall out a bit. It also doesn't show up that much when applied with a brush but it would be perfect as a transition or crease shade for pale beauties. Bananas is my favourite shade in this palette, a very light gold shimmer that applies easily and feels quite buttery. The payoff with a brush is a bit weaker than with a finger, but it adheres really well to the lid. Extra Creamy is a white that resembles bone, and it is fully matte. This one isn't chalky but it isn't as pigmented as one would hope from the pan. The middle column has a collection of the most vibrant shades in this palette. At the top, we have the Peanut Butter, which is a matte copper, and it applies better with a brush than with a finger. The middle one, Peanut Brittle, is probably the best bang for your buck, being an intense shimmery copper that applies amazingly well, and blends like a dream. At the bottom is the most unusual shade in the palette, Jelly, a violent purple with a lilac shift. It isn't very pigmented, offering a sheer wash, which is better for the faint of heart (like me). The column on the right has its pros and cons. For example, Peanut Butter Cup is your standard everyday brown shade with a bit of shimmer in it, and it is quite pigmented even with a brush. 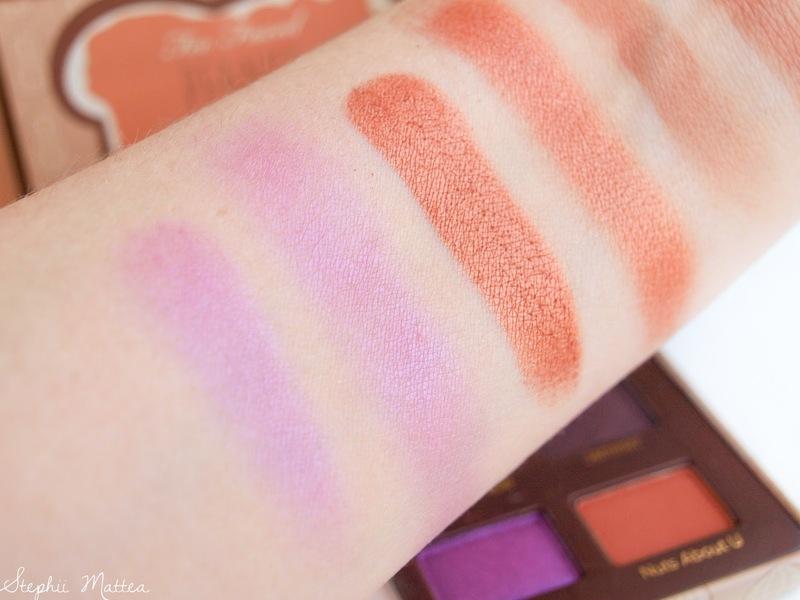 On the other hand, Jammin' is the worst shade in this palette. It looks like such a lovely plum with gold glitter in the pan, but the payoff is pathetic, it goes on more brown than purple and it looks quite muddy on the eyelid. 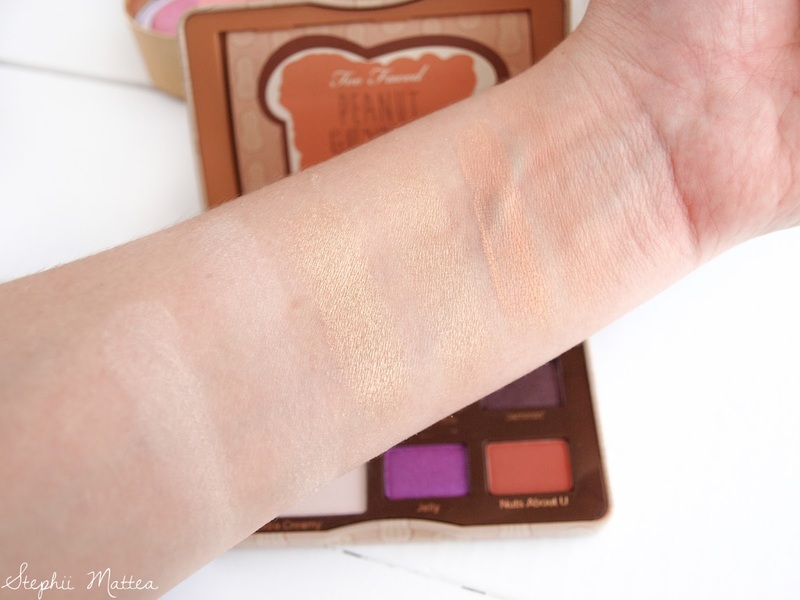 Nuts About You is somewhere in the middle of the scale, being that it's such a nice matte rusty-brown shadow that looks awesome either as a lid colour or crease colour, but the payoff isn't as great as, say, Peanut Butter. It actually applies a bit streaky, even when swatched with a finger. This palette was actually a bit underwhelming, considering the $58 AUD price tag. Sure, some of the shades were lovely, but I've gotten more consistent results from an I Heart Makeup eyeshadow palette. Nevertheless, I still use this palette because there are many wearable shades for day-to-day use and I can work with most of them. Sure, there isn't a darker shade to deepen the crease or use in the outer corner, but it isn't the end all, be all with this palette. If I wanted a smoky eye, I could just go for one of my other palettes. My verdict? If you've got a high disposable income and you like collecting palettes from Too Faced, then go for it. However, if you're trying to make every cent count like me, then this palette is not the one you want. If you're really interested in getting a palette from Too Faced, I would suggest getting either the Original or the Semi-Sweet Chocolate Bar, as you have a wider variety of shades to choose from and the quality is more consistent. What do you think of this palette, or other Too Faced eyeshadows in general?